Adam Sandler first performed comedy on a stage at the age of 17, on open-mike night at a Boston club. Later, while he was a freshman at New York University, he landed a recurring role as Theo's dim friend Smitty on The Cosby Show. He was a writer and performer on MTV's TV trivia show Remote Control, and made his movie debut in 1989, in an abysmal comedy called Babes Ahoy, starring Burt Young and Billy Zane. The movie was so bad it wasn't released, even on video, until several years later (re-titled Going Overboard), when Sandler's name made it marketable. After Babes Ahoy, Sandler became a semi-successful stand-up comedian in the Los Angeles area. When Dennis Miller caught Sandler's act, he recommended Sandler to Saturday Night Live's Lorne Michaels. Sandler auditioned for SNL, and was hired as a writer, not a performer. He first appeared on the air as Tom Hanks's brother in a December 1990 skit. 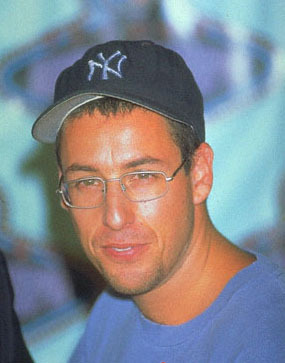 After numerous other appearances, Sandler was promoted to full-fledged cast member with the start of the 1993-94 season. The Los Angeles Times described Sandler as "the most talentless, juvenile and offensive member of the current cast". He appeared on SNL as Bruce Springsteen, Axl Rose, Eddie Vedder and Bono. In a 1994 sketch that drew numerous complaints, Sandler's "Canteen Boy" was seduced by Scoutmaster Alec Baldwin. But mostly, Sandler's stint at SNL is remembered for his silly but funny songs, including "I'm So Wasted", "LunchLady Land", and "The Hanukkah Song". Back on the big screen, Sandler had small roles in Shakes the Clown with Bobcat Goldthwait and Coneheads with Dan Aykroyd and Jane Curtin. He co-starred in Airheads with Brendan Fraser and Steve Buscemi. Then came Billy Madison, the first recognizable "Adam Sandler" film, with Sandler playing his trademarked idiot-loser-goofball. After Happy Gilmore with Bob Barker and Bulletproof with Damon Wayans, The Village Voice said that "Adam Sandler movies are the skivvie skid marks of modern American cinema". Some critics almost apologized before sheepishly admitting that Sandler's The Wedding Singer was a pretty good movie, while others suggested that co-star Drew Barrymore deserved all the credit. Naysayers were skeptical when Sandler took a huge pay cut to star opposite Emily Watson in the low-budget art film Punch-Drunk Love, but his reviews were terrific. He has since returned to fart jokes with Mr. Deeds, rendered himself a cartoon in Eight Crazy Nights, slept with Jack Nicholson in Anger Management, and again earned critical raves in James L. Brooks' Spanglish. Before leaving SNL, Sandler got his college roommate, Tim Herlihy, an interview with Michaels. Herlihy became a writer on SNL, and later co-wrote some of Sandler's biggest hit movies. True to his friends, Sandler has also produced films for Dana Carvey, Rob Schneider, and David Spade.